I love giving presents (and yes, I love receiving them as well!) I love planning and thinking through what a person may love and designing something perfectly to suit them. We mull every year about whether we go to doing a family secret santa and just purchase for one person...However, if we were to I would miss this opportunity to devise something tangible for those I love. I have been so thankful for the extra time I have had this year to create/plan and shop (online) for the gifts for those around me. It broke my heart the past couple of years to need to resort to gift vouchers! Blog Posts to come on each of those shortly! I love Christmas food...simple spreads of cold meats and seafood, antipasto plates, tasty summer desserts, a BBQ with friends, a glass of sparkly or a wine. I love the casual gatherings over this period between Christmas and new year. BBQs with friends, Christmas Eve drop in, annual Christmas Day McDonalds breakfast with many of my church family, family Christmas lunch, casual swims after church...everyone excited that the year has wound down and there is a forced work closure! Life slows down. I do find these gatherings a challenge...energy wise...but I am thankful for friends and family that make these as pain free as possible for me. And who spend the time to love on me! I love that despite the focus on diversity and tolerance (both important) that Christ is still the centre of CHRISTmas. Christ. The one who we celebrate and who we find our hope. We stop and celebrate the birth of the one who gives us true hope, true joy, and who we can trust in. Christ. The one who makes this the most wonderful time of the year. Wishing you a wonderful Christmas 2015, and that no matter the challenges, the pain, or the hardships, that you have been able to enjoy in your own ways this time of year. The holiday season is well and truly here. A joyful time full of many festivities, parties, catch ups, events and family reunions. It can be the worst nightmare of a person with a chronic illness! Not only is this season a physical challenge for managing energy levels, stress, health and dietary constraints, but it is a season where you are bombarded with countless occurrences of the dreaded small talk. Small talk…the painful superficial conversations you have with new acquaintances and people you only see once a year. Finding a quiet place to sit, so you can conserve some energy and not have your cognitive function battling the additional noise. 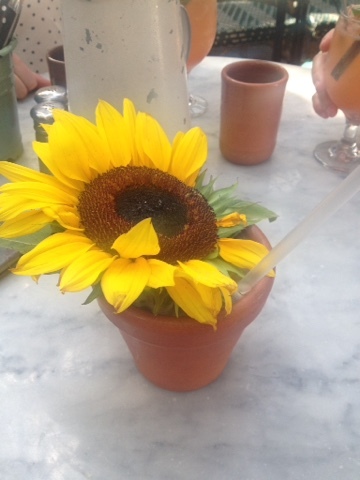 Avoiding the alcohol which can exacerbate symptoms, or react with medications. Eating beforehand, so your stomach isn’t grumbling as plate after plate of food that isn’t on your specific diet are passed by. Coming to the event with a good friend or partner, who is happy to help you escape when the evening or conversation becomes too much. However, it is the content of these conversations that are the real challenge. Distant relatives, partner’s colleagues, long lost ‘friends’ all wanting to know the same two basic questions… “How are you?” and “What do you do?” Both perfectly reasonable questions in themselves, but when your days, weeks and months are primarily spent in bed, at medical appointments or at times in the hospital, and in reality you feel like you have been running the marathon whilst having the flu, how do you respond? Yes, you have made it out of the house and to the event, and yes, you have made an effort with your make up, your outfit and your plastered on smile, but the reality of how you are and what your year has been like is a far cry from pleasant superficial small talk. So, how can you respond to these questions? Let’s start with the first one…“How are you?” which is pretty much guaranteed to start most conversations. This could be interpreted that you are a healthy individual without any cause for concern. Whereas, what you probably mean is that in the scheme of things you are actually doing pretty well, you are out of bed today, the pain is manageable and things could really be a lot worse. This could be taken that you have had your ups and downs (like most people) and are generally just cruising along. However, what is going through your head is that you are actually feeling okay at this moment, but if they were to ask you again in 20 minutes after enduring standing at this party and making small talk, your answer may be the same. Yet, by this stage you are holding yourself up on the wall you are leaning against, you are missing every second sentence spoken, and really by now just want to be home in bed! Here you have gone for laying all of your cards on the table…you do feel like you have been hit by a truck. That is, everything hurts, and you are struggling to function. Just be prepared for the person who you are speaking with to think you are a hypochondriac and watch them try to escape the conversation as fast as possible. Sadly, there appears to be no middle ground….however, if the conversation has survived the first stage of “How are you?” and has moved onto the “What do you do?” how do you respond? 1. “I am a _______”. Insert own profession and hope the follow up questions don’t require you to disclose your omission that you haven’t worked in over a year due to your health. Redirect as soon as possible to talking about them! Again, redirect as soon as possible, people love talking about themselves! Please note, this answer may result in funny looks, and a quick exit from the conversation. Leave it at this and the air of mystery that surrounds you. And with that, you smile sweetly, grit your teeth and make a choice; either exert your remaining energy for the evening on educating that individual about your illness with as much grace as you can muster, or excuse yourself and head to the bar knowing this is going to be one very long night! This has also been published at The Mighty and can be found here. 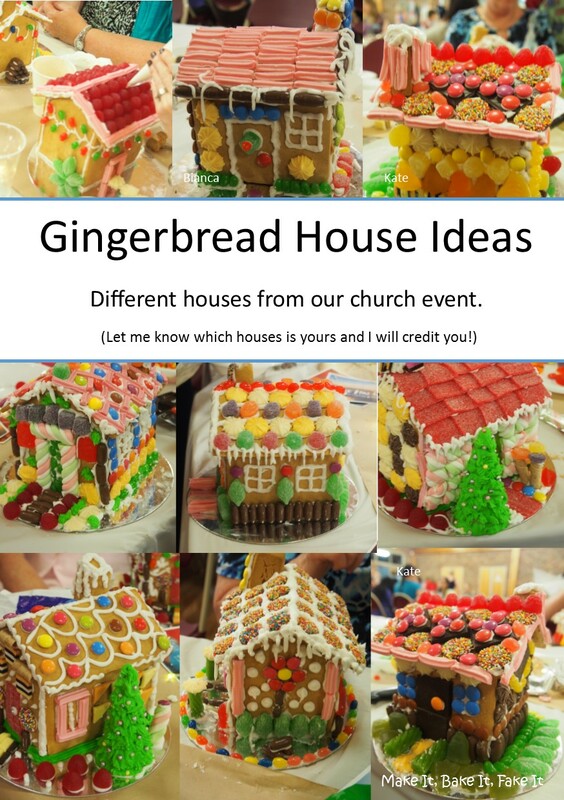 I love getting my creative on with making a Gingerbread House each year. This year was a push for energy and I ended up throwing lollies on it, as I was rather tired by the time it came around to finish decorating it! 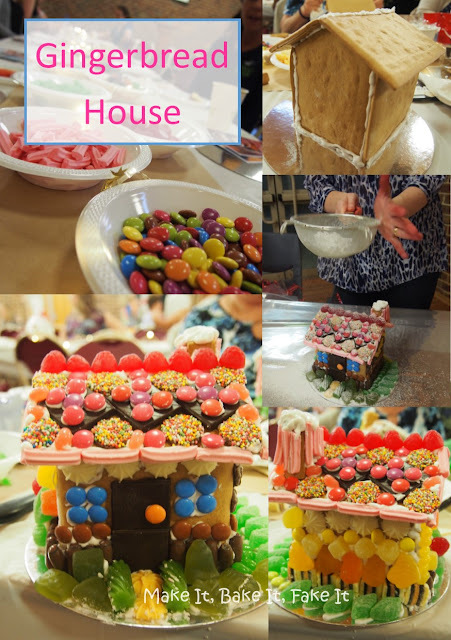 I was excited that this year I was able to have a gluten free house....still not dairy free...and no comments about the lollies...but at least my household who are 3/4's gluten free can enjoy it. I love coming away with ideas from Gingerbread House making nights. This year I decided to capture some of these. If you are the owner/artist of any of these beautiful houses, please let me know which one is yours and so I can send the credit back your way! Aren't people clever!!! Love a good Gingerbread House! I was so so excited when my housemate brought home a tin of sweet condensed COCONUT milk...yep...you read that correctly...coconut! My Make It, Bake It, Fake It dreams have been realised. Finally so many simple recipes that I use to make in my pre dairy free and gluten free lifestyle could be brought to life! Slightly more expensive than I would have spent on coconut milk...but easier than attempting to make it myself. I've spent the week in a ton of pain...crazy fibromyalgia causing havoc! So, have been trying to keep myself occupied and hoping I can pretend to ignore the pain...not having much luck...but baking is a good stress reliever for me...and this was within the realms of energy usage this week. 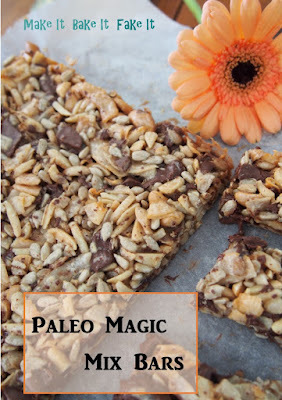 This recipe use to be one of my favourite whip up treats...and now I can bring you the paleo version. 3 cups mix of nuts (any), coconut, dark chocolate, seeds, oats (non-paleo)... 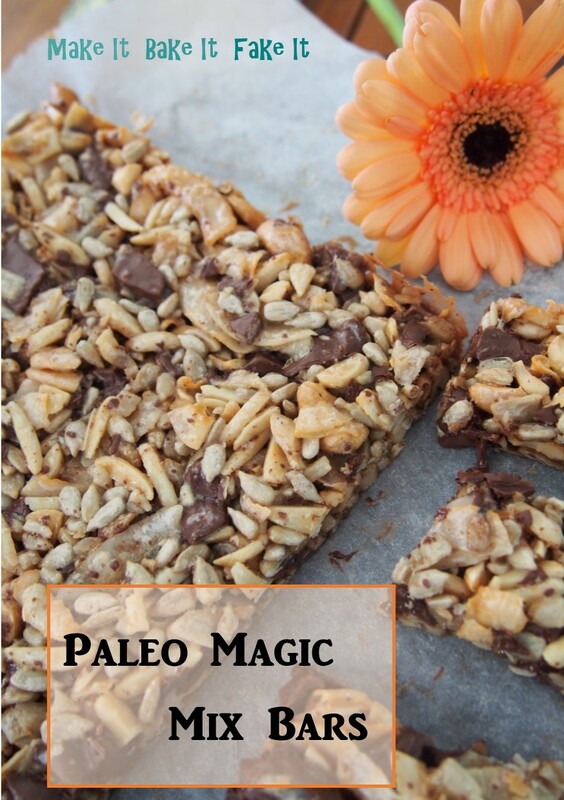 I used almonds, dark chocolate, cashews, flaked coconut and sunflower seeds. Roughly chop nuts/coconut/chocolate and seeds. Keep pouring until the mixture has been moistened but is not wet. Press mix into a brownie pan lined with baking paper. Bake in the oven for approx 20 minutes until golden. Allow to cool in pan. Slice into bars or squares. These bars end up slightly caramelised...and also similar to muesli bars. Great for a snack or a treat. It was a good friends birthday recently. Not just any birthday...the big 3-0, which she managed to celebrate in a very unique way...but that is her story for another day. Anyway, I had been racking my brain for awhile for what to get that was different, special and would work in her newly renovated home. 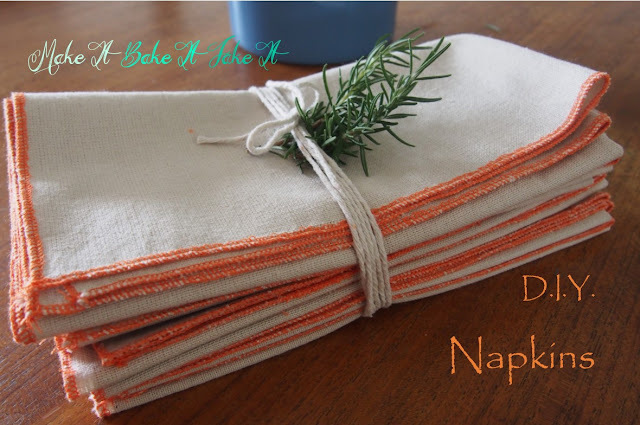 I spotted some Pins awhile back that were for multicoloured napkins and just knew a set of these in orange would be perfect to compliment her beautiful new dining area. This was also going to be my first attempt at using my overlocker...thankfully, I have a lovely mother who helped me out try and make sense of tensions!! My early attempts, well, there were a lot of early attempts!! Then the other drama was sourcing the fabric and the cotton. When I stopped in at the local spotlight to source some fabric it was mayhem, more so than normal. Turns out they were relocating, but it didn't help the fact that the shelves were half empty and the place was a mess. I couldn't find a cotton/linen that I liked at a price that worked for me...then I discovered the curtains on sale. Problem solved! One curtain, which I think was about 140x220cm made a set of 8, with 2 additional ones I had stuffed up, and maybe 2 more to spare. Now then the cotton, I was sure I wasn't going to be able to find orange overlocking cotton, and after there being a total of 2 reels of orange in the whole of Spotlight I gave up and tried the local Craft Depot. It took me a while to decide on which cotton or polyester reels to get, I had finally decided on what I thought would do, took them to the counter and discovered a whole range of overlocker thread in its own section...including (with some rummaging) 4 reels of orange. WIN!!! -Enough linen/heavy cotton/fabric to make the desired number. 1. I measured and cut my fabric to 45cm squares. 2. Overlocked in orange doing a tight/rolled hem along each side. Next job...find some teal thread...I want a set for me!!! Note: Spend some time fiddling around to get the right tensions on your machine that work best for your fabric. Mine ended up being quite a bit different to the machine's manual. Why am I too scared to use my disability parking permit? I received a disability parking permit this week...yet, I am currently too scared to use it. Too scared to face the condemning looks as I step out of the car and walk without visible impairment into the shops. Too scared to hear the words, 'But you are not disabled!' shouted across the parking lot. The many stories making the news this week of others facing the same issue are most definitely not helping me feel any more confident about accessing these parking spaces. See I have an invisible illness. A chronic illness that it is not apparent by looking at me, the 30-something, well presented woman standing in front of you. Yet, I have a very real, very debilitating and crippling disease. You could walk past me and not have a clue to what is going on inside my body, I look no different to the person next to me. However, I have a body where breathing is exhausting and the pain is constant. A body that doesn’t allow me to leave the house or my bed on a regular basis. There is nothing imaginary about my illness. Three years of debilitating symptoms are proof of this. It may be invisible, yet it is very real. One of the different requirements of the permit I received is that you are detrimentally affected physically by walking 100 metres. I am ashamed and embarrassed that my life has been so hugely affected by 100 metres. Three years ago I was training for a half marathon. These days 100 metres is torture, and has day long repercussions. If I do make it out of the house, I am the woman praying fervently for a parking spot as I do laps around the car park. 'Please God, let there be a close spot today. I don't have the energy or the pain levels to have to walk from the back of the parking lot.' I am the woman who had long outsourced my supermarket shopping. I am the woman whose last attempt to try clothes on in Target left me in bed for a week...and I didn't even walk away with a new dress! I am the woman attempting to attend 3 to 4 appointments a week to manage my disease. I am the woman whose only achievement in a day is making it to that appointment. Take for example my physiotherapy appointments. These are located one suburb over...a five minute maximum drive. Yet the parking situation is so atrocious in this suburb that I need to leave 20 minutes before the appointment, take 5 minutes to get there, spend 10 minutes driving laps around the multiple carparks trying to find any parking spot, and when I do find a spot make sure I have 5 minutes to walk over 400 metres to the clinic. Then I have a 30 minute appointment that requires both physical and cognitive energy, and then I need to make the walk back to the car. The toll that this takes on my body leaves me in bed for the rest of the day. If I was able to access one of the disabled parking spaces closer to the clinic, this might mean I have enough energy to make and eat my lunch when I get home, or not max out my pain medications for the day. Then I wonder about the other benefits of accessing these parking spaces. Maybe I could make it to the pharmacy to pick up my medication without it being my only outing of the day, and leaving me doubled over in pain? Maybe I might be able to make it to the beach, or the movies, or out for dinner, and actually be able to enjoy being out of the house, instead of worrying about how far away I am going to need to park and how much of my limited energy it might use? Maybe I will be able to reclaim some of my independence, not needing to rely on someone else to drive me just so they can drop me at the door? Maybe it might be okay? Yet, why am I so scared? Is there such large scale abuse of these parking spaces from those who do not meet the requirements to park there? Is there that much of a misunderstanding of disability and illness? Is there a culture of mistrust of medical and government organisations that make the decisions to approve these permits? Why then do people receive such abuse for parking in a space that they have both medical and governmental approval to park in? What does this say about our tolerance, our compassion, our understanding of others? I would honestly give anything to not need to park in one of these spots. I hope and pray that as I begin to use my permit there will be enough compassion, grace and understanding for me to be able to access that 100 metres that my body will allow. I live with enough personal shame and embarrassment about how my body has left me, I hope I won’t have more of it inflicted on me by others. 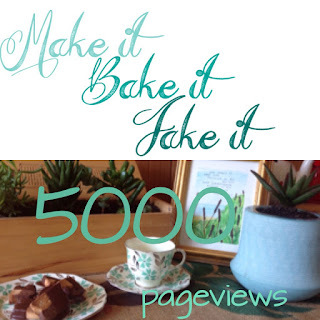 Make It, Bake It, Fake It now has it's own page over on Facebook. Please stop by and like us! You can also find us on Instagram and Pinterest too! I have been feeling so so so under the weather the past week or two...so not much is happening on any front. However, I finally set up a Facebook page...and so that was at least some progress. This week I have also been joining in on the #7vignettes being run over on Instagram by @domayne_australia and @interiorsaddict. I am slowly and surely trying to work on my photography skills using my mum's camera...so much better than the iphone pictures I have been attempting to use in the past. Check out the Facebook page and Instagram for this week's images. I baked for the first time in forever this week! Yay! Anyway, I needed something tasty, easy and quick. Hence today's Posh Packet Mix. All the additional ingredients were things I happened to have on hand too! Easy as!!! When you have such limited energy as I do, I am all up for the quick and easy that look and taste amazing too. No body would guess that this is a packet mix! So anyway, I should have been using what energy I had to make something decent to eat...as I am pretty much out of my stash of freezer meals...but I love a good baking adventure...so this was partly therapeutic too! I used the Aldi ' Has No' mix. I made sure all the ingredients I added were dairy free. So ended up with a tasty dairy and gluten free treat. When I served it on Thursday night no one would have even noticed it was gluten and dairy free...apart from the fact I was enjoying indulging in it. 1. Make brownies as per packet instructions. 2. Add in coconut essence for a nuttier taste. Stir well. 3. Lightly stir in raspberries and extra choc chips. 4. Bake as per packet instructions. 5. When baked and cooled, mix up icing. 6. Spread icing on top. 7. 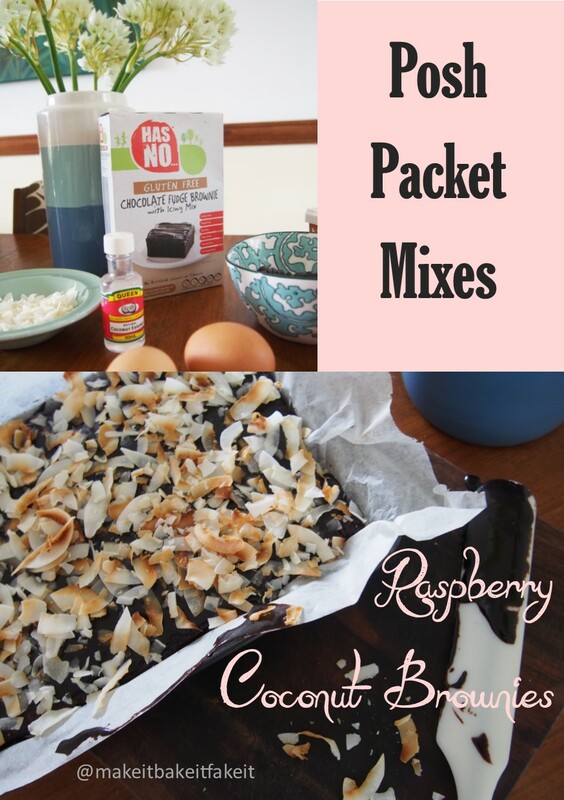 Sprinkle with toasted coconut. 8. Cut, serve, eat, enjoy! I was so excited to receive this beautiful book (Meditations by Lorien Atwood) a few weeks ago. Sadly, I was one week post surgery on my right shoulder at the time, and as much as I claim to be vaguely ambidextrous, the thought of getting stuck into it with my left hand was all too much. Over the past couple of weeks since the book has been released, I have followed along on the Facebook Group 'Colouring In Truth', watching beautiful images emerge as people have spent time in God's word, putting time aside to meditate on the truth. All this time I was itching to get started on my own interpretations. Finally, my arm was out of the sling and I could begin without fear of too much wobbly out of the line actions...I am a perfectionist in some things...surprisingly, colouring in is one of those things. So it was a great joy to have enough movement (and confidence) to get started. Now, I have been a fan of adult colouring long before it became cool. In fact, colouring in or doodling is something we use to encourage the participants in our training courses to do to assist concentration. It has also been something that I have been able to do when Chronic Fatigue Syndrome has left me unable to do much at all!! So, it definitely falls into the 'What to do when you can't do a thing' category for all those struggling with life with a chronic illness. There are also some pretty cool features of this book...removable pages, one sided images, thicker weight paper, and free downloads once you have purchased the book. There is also an option to purchase group licences of images for event use. If you want to delve deeper into the passages and the thoughts behind them Lorien has begun blogging about them here. Anyway, I am itching to get into more of this book...however, my shoulder is currently being slow to allow! 'Be joyful in hope, patient in affliction, and faithful in prayer"
Meditations can be purchased at www.lorien-illustrations.com. A lot has been happening this past week...birthday celebrations, adventures with fun friends, appointments, days recovering in bed, and then to top it off having my article published in Mamamia. I am loving how the awareness of CFS is spreading...it is such an invisible disease, and so so many people are affected by it. Thank you for sharing the awareness with me!! I don't have a lot to say today...blame the brain fog! But really wanted to say thank you to those this week who have encouraged me, celebrated with me and blessed me abundantly. It's my birthday today. And yes I have already started the celebration of Kate with cake this week. I have also enjoyed celebrating with family and friends. However, I was also a bit excited when a post I wrote for The Mighty was published today. Each and every day I am fighting to challenge the perceptions surrounding Chronic Fatigue Syndrome (CFS), whether this be with well-intentioned family or friends, disbelieving medical professionals, or random acquaintances who are convinced to sell me the special (expensive) supplement that healed their great aunt. Walking through life with this disease has been both a battle and a blessing for me over the past three years. It has turned my life completely upside down. It has impacted my health, fitness, social life, finances, living situation, independence and career. There have been plenty of hard days, but surprisingly many moments of joy too. However, one challenge I end up facing time and time again is not from the disease itself, but from those around me, and their understanding of this disease. So, here is what I wish people understood about Chronic Fatigue Syndrome. Each and every morning I get up and choose to fight. I choose to put one foot in front of the other, even though I would rather be in bed. I choose to look my best, despite feeling sick to the stomach and existing with constant bags under my eyes. I choose to interact with those around me, even when I can’t keep up with the conversation. I choose to smile and say I am fine, even though that is far from the truth. I choose to keep my illness invisible. Why is this? Why do I fight so hard each and every day to keep moving forward? To keep putting one foot in front of the other? 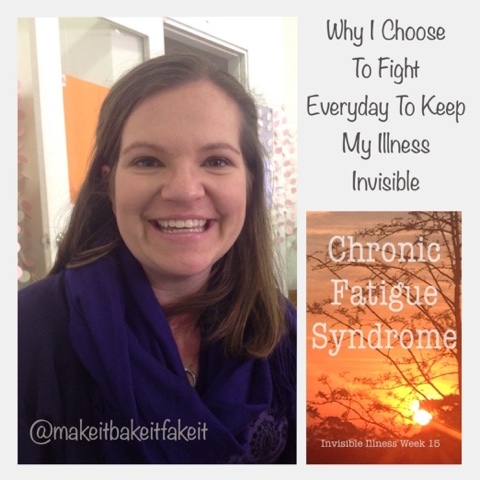 I choose to keep my illness invisible…because when it does become visible we have a problem! Very few people have seen the full effects of this illness (Chronic Fatigue Syndrome) on my life. I could probably count them on one hand the people who have seen the depths of this illness. Even my housemates and my family have not seen it. See, this illness is invisible. All the symptoms aren't visible to the naked eye. And so that means I look like anyone else around me. You could walk past me in the street, and wouldn't think twice. We could have a perfectly enjoyable conversation, and you still wouldn't notice. I could turn up to work, to church, to a party, and still it would not be obvious at all. Yes, I may have heavy under eye foundation on, yes, I might spend more time sitting down than standing, and yes, I might occasionally miss a part of a conversation, or forget the word that I was trying to express, but you wouldn't think much of it. It is when you delve below the surface and look at what is going on that you truly see this disease…and it is not a pretty sight! The pain that is sweeping through my body that four different types of painkillers are not making a dent on. Muscular and joint pain, throbbing, aching, burning. The sharp stinging pain in the soles if my feet from standing too long, the constant headache, the ache in my back from the hard plastic chair. The fatigue that leaves me nauseous and out of breath, when the simple task of breathing has become a laboured affair. The cognitive brain fog which has me mixing words, being unable to calculate simple arithmetic, confused, and directionally challenged. Constantly trying to keep pace with the world around me, keep up with the conversation, and remember where I was heading and what I was doing. The emotions that can leave me crying uncontrollably, at anything, because I am that tired that I am unable to function. The upset stomach that spasms, unable to decide if it is happy with food today or not. The gut wrenching pain that has me doubled over in the bathroom. The dizziness every time I stand or bend over. The need to stop and lean against the wall on the trip from my bed to the bathroom in the middle of each night. A body collapsing in on itself. All of this happening inside of me. Naked to the human eye. Sometime I wonder what I would look like if all these symptoms externalised themselves. If what I felt was what those around me would see. So instead I choose to fight to keep my illness hidden. To cover up the bags under my eyes, to keep putting one foot in front of the other. To keep fighting with a smile on my face. Please remember that my choice to fight to keep my illness invisible, does not mean it does not exist. It is real. My choice is to keep fighting. I hope your choice is believing and truly seeing the invisible. Things take a while to do when you live with a chronic illness...particularly a fatigue based one. I actually started completing this last year...but never got around to finishing it. So, I have now neatened and updated it...hope it is useful for learning a bit about my life with CFS. 2. I was diagnosed with it in the year: 2013 (one week before heading to the US on a holiday I had booked months earlier). This followed suddenly going from being able to run 14kms (slowly, I admit), to having breathing issues running around a block. 3. But I had symptoms since: late 2012, I always wondered why my 3pm-itis was so bad! I'd get to the end of a school day and all I would want to do was put my head down on the desk...that, and eat a lot of chocolate! 4. The biggest adjustment I’ve had to make is: there have been so many.... The grieving process associated with a change in health, fitness, social life, work capacity, housing, income, and career to name such a few. It has really challenged me to think about what things I value above God, and I have been so humbled in this. 5. Most people assume: that I am fine! Or that my disease is just about being tired. Have a read of this blog post here if you want to find out a bit more about what tiredness really means to me. 6. The hardest part about mornings are: the 9am slump. I can get out of bed and get moving but by 9am I have hit the wall and all I want to do is be back in bed. 8. A gadget I couldn’t live without is: a microwave...essential for zapping any vague food source when you can't face cooking or even eating. So thankful for friends and family who have kept my freezer stocked over the past few years. 9. The hardest part about nights are: needing to think ahead about whether I have enough energy to be able to drive myself home. That and missing the sleep window at night (the zone where sleep is possible) , and then being awake for hours. 10. Each day I take a minimum of 10 pills & vitamins! 11. Regarding alternative treatments I: am willing to give them ago. 12. 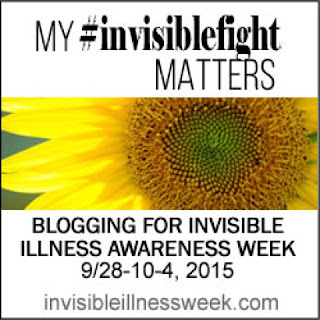 If I had to choose between an invisible illness or visible I would choose: visible, maybe?! I don't know....I don't know if I'd want to look as sick as I feel all the time...but it would be nice to not need to explain yourself all the time. 13. Regarding working and career: it's been hard to accept that it is on hold at the moment whilst I balance my life as a professional patient! 14. People would be surprised to know: how much I miss running! 16. Something I never thought I could do with my illness that I did was: complete Tough Mudder. I didn't realise I had CFS when I did it! I am thankful for my friends on my team who helped get me through. And write...I never started writing and blogging to the same extent in my pre CFS life! 17. The commercials about my illness: I've never seen any! 18. Something I really miss doing since I was diagnosed is: entertaining, baking, hosting others, holding dinner parties...I would love to be able to even just go over to a friends house for dinner. 19. It was really hard to have to give up: crossfit. It has involved being on the outside of an awesome community, not just the exercise side. That and serving at church. And work and career aspirations. And social life. Oh...and reading...what I would give to be able to spend more than 20mins reading at a time. 20. A new hobby I have taken up since my diagnosis is: crochet... However, only in moderation. Surprisingly, it hurts my hands to crochet! 21. If I could have one day of feeling normal again I would: run, and bake, and host a big dinner party and not be scared of the ramifications and the next day! 22. My illness has taught me: to find joy in Christ. Not in the earthly things that I can't depend on. 23. Want to know a secret? One thing people say that gets under my skin is: "you look great today, you must be doing well." All I can say is, looks are deceiving! The more make up I am wearing...the worse I am feeling! 24. But I love it when people: offer to do something to help out. "Can I drop a meal by?" "Can I come and vacuum your floors?" Or bring me flowers...you just don't get flowers when you have a chronic illness! The pain that you are experiencing cannot compare to the joy that is to come! 26. When someone is diagnosed I’d like to tell them: there are some great supports and services out there. I was blessed by a friend telling me about the Fatigue Clinic at UNSW in Sydney. I was able to get into their program way earlier than a lot of people do. Plus learn to smile politely every time someone offers medical advice and cures that healed their 3rd cousin once removed! 27. Something that has surprised me about living with an illness is: is how far grace can sustain you. To this point there has not been a day that I haven't survived! 28. The nicest thing someone did for me when I wasn’t feeling well was: there have been so many people who have blessed me during this time. I think one of the simplest has been the friends who have actually asked me how I am and expected the real reply. 29. 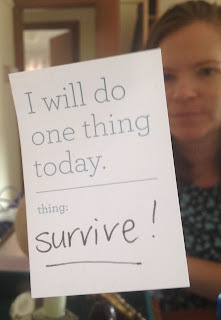 I’m involved with Invisible Illness Week because: why not. I have an invisible illness. People look at me and see normality. However, there is so much going on inside each of us! 30. 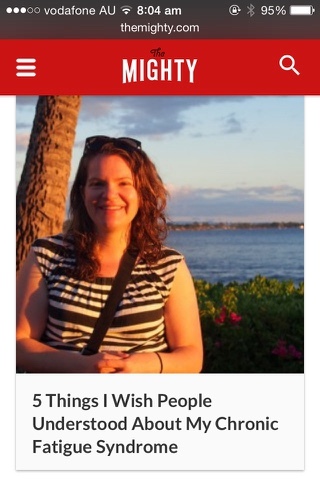 The fact that you read this list makes me feel: thankful. I am so thankful for those who have encouraged me with my blogging and writing through this adventure of invisible illness! Life can be hard. There is no doubt about it. Life throws you curve balls that you didn't expect. These happen to everyone. They are tough, they are effort, and they can cause pain and heartache that you just didn't bank on in your everyday week. You crash your car, the garage floods, you injure yourself at work, you need to move house, the insurance company mucks you around, you catch a bad chest infection, your car number plates get stolen, you need surgery... the list goes on. All not too out of the ordinary things, but definitely enough to cause more than a blip in your week. I've experienced a number of these recently...actually...all of these, and as I have struggled to deal with each one without feeling completely overwhelmed, I feel that I keep being told that they are 'normal things' that 'everyone experiences', and essentially 'what's the big deal? ', and I walk away feeling like a drama queen. Why then are these life 'blips' or 'curve balls' threatening to overwhelm me? See, I have chronic fatigue syndrome, and with this comes a whole lot of additional baggage that makes each of these 'slightly-out-of-the-ordinary' blips on my life so much harder to deal with. With that in mind I thought I would take some time now to share why this is...why these events/occurrences knock me around so much! Have you tried making any decision or deal with any change in circumstance or routine whilst functioning on the equivalent of an hour or two of sleep? This is a baseline for someone like me with a fatigue based chronic illness. You are so ridiculously tired and fatigued you are nauseous, and then something happens and someone somehow expects you to make an informed, rational decision about life, and to do so WITHOUT tears! Who are they kidding...I have enough trouble verbalising my regular coffee order each day!?! Along with the decreased rationality comes brain fog. A phenomena where your brain literally feels like you are wrapped in cotton wool, and all clear thinking and brain activity is well and truly grounded. Over the years I have taken pride in being able to manipulate numbers quickly and easily...not any longer...I struggle to now add up my share of a bill in a restaurant...the sort of maths I used to teach my first graders to do! So now something like trying to make sense of bungled insurance payout paperwork, seems as tricky and as foreign as calculating quantum physics! In the past month I have had a pretty decent chest infection. Some of the symptoms that are experienced with this include pain, fever, headache, fatigue, muscle aches, sore throat, nausea....wait a minute...am I talking about a chest infection or chronic fatigue syndrome? These symptoms are my normal everyday experience of life with CFS. So take that as the baseline and add in on top of that all the symptoms (many of them double ups) of a respiratory infection and you will soon understand that what getting an infection on top of a chronic illness might actually look like! I have a certain (rather small) pool of energy that I can access each day. For me, that energy does not stretch as far as shopping, cleaning or doing my own washing...I use enough energy each day having a shower, eating and trying to make it to countless medical appointments. Each week is planned and managed closely so that I can try make it through the week without any major fatigue crashes. So when you throw in the need for trips to the motor registry for new car number plates, the hardware store for screws for the new plates, phone calls to the police and then to the insurance company, and out goes the window my entire well planned energy conserving week, and in its place comes a couple of days spent in bed. Then take something like moving house. I have now moved 3 times since having CFS (and 3 times as an adult prior to this). Moving is torture...I am sure we can all agree. Moving with a chronic illness is a nightmare. Why? Because I know how much energy, effort, planning, exertion and physical pain goes into moving, and I know I don't have anything close to that kind of energy...not even if I was to save up all my energy for the month and commit it all to the moving process...I will still be stretched way beyond what I can physically and cognitively do...and so because I know what is ahead of me, and how I know my body will not cope, the stress and anxiety about it goes through the roof. So now not only am I trying to manage my physical energy levels but my emotional levels as well! When chronically ill, you spend a lot of time second guessing yourself. Maybe this is a result of the countless medical appointments when you have walked away in tears after yet another doctor has not validated your illness purely because the test results 'do not make sense', or after being told again and again by people around you that you 'look well, you must be feeling well'? Am I imagining things? Am I making a mountain out of a molehill? This perpetuating cycle keeps gnawing away at you as you attempt to balance all of the above, whilst trying to tackle the curve ball in the week. Now, don't get me wrong, I don't want this to be a pity party or a shaming conversation. See, despite these curve balls being plain out a challenge to deal with, they are only part of the larger picture. I am thankful that the hard things in life are nothing in comparison to the certain future and awesome hope that I have. I know that these things are fleeting... 'The pain that you are experiencing does not compare to the joy that is to come.' (Romans 8:18 paraphrased). I am so thankful for this hope. I am thankful for those walking alongside me who know that life with chronic fatigue syndrome is hard, and who support me along the way, who make sense of my financial paperwork, who listen through the tears, who interpret the irrational me, who drop sushi over 'just because', who give up their free time to help me pack and move, who drive me to countless appointments, who help me with the everyday, and point me to Christ. And who reassure me that I am not a drama queen...and help me to survive whatever life throws at me! Today this little blog celebrated reaching 5000 page views! No longer needing to write out recipes for friends for some 'Kate Creations'...instead just being able to direct them here! So, thank you for stopping by and checking it out!